It’s been awhile since I’ve written a good ole food blog! And, this one is incredibly yummy (actually I just ate some and I can assure you that it is)! Food, nourishment, sustenance, living closer to the elements, herbs and plants, healing my gut, and putting my hands in the soil and growing food have all played an instrumental role in my mental, emotional, and spiritual recovery and resulting sense of well-being. Before I started this journey about 15 years ago, I barely knew that feeling better was even possible! And now I know it is. One personal discovery I’ve made is that how I actually LIVE my life is my medicine. Unfortunately, in the modern world,our lives have literally been designed to be unhealthy. We affirm this design by not questioning it. Even though I do believe we are on the road to recovery as a culture, many of us are still working on breaking the addiction to the cannot-thrive-drive. Sunflowers! A friend, who runs the Facebook group, Southern Cultured, recently shared some beautiful pictures of a recipe using sunflower heads. She adapted her recipe from Chef Draghi in Boston (I’ll link to his video below). In this blog, I’ll share with you how I adapted the recipe while encouraging you to let your creative juices flow! Actually, the common artichoke comes from the Sunflower Family. 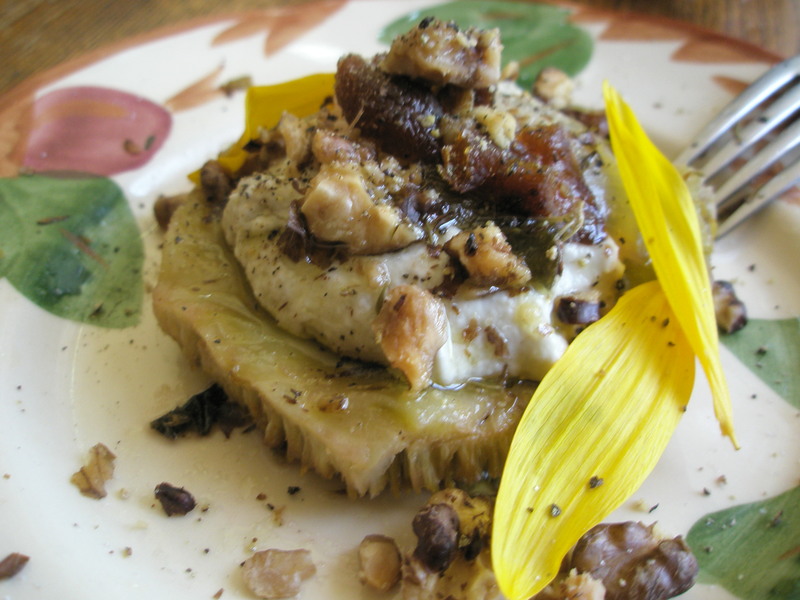 And, you’ll notice how the chef in the video below refers to the sunflower head tasting like an artichoke heart. 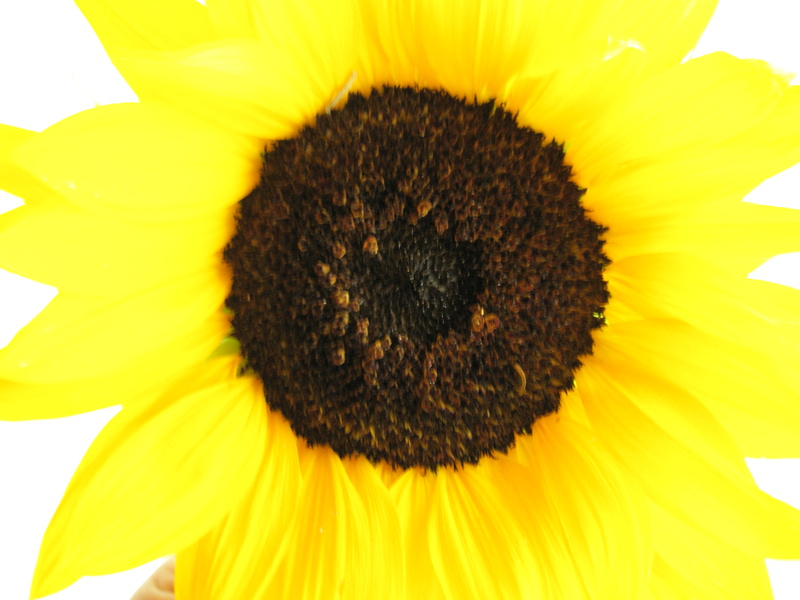 This radiant flower (or flowers) not only is stunning in your garden and in your home, and not only does the plant produce yummy seeds, you can also eat the sunflower head. To get started, you’ll need to watch Chef Draghi do his thing. And, while Chef Draghi went for a full-fledged Italian approach using herbed ricotta, I swerved East and South and brought in some other flavors. I wanted to incorporate some baba ganoush (ghanoush) that I had made from local, in-season eggplant, tahini, lemon juice, olive oil, and sea salt. I hought that it would be delicious on top of the braised sunflower head (and it was!). Personally, I also did not want to crank my oven up on one of the hottest days we’ve had here in Mississippi (as his recipe instructs)! So, topping it off with something that had been chilled (the baba ganoush) was ideal for me. Basically, I followed the chef’s braising technique with herbs, lemon juice, and olive oil. However, instead of using white wine, I used honey wine that I had made at home. I also added a small onion during the braising process to soften them for the dish and to add flavor. When the dish was done braising (about 10-15 minutes on low to medium heat), I removed the sunflower heads. I topped it with baba ganoush, soaked and roasted walnuts, diced dried apricots, the softened onions, and then drizzled some olive oil.